So today I was cleaning out my office – guess you could call it Fall Cleaning – as I was going through some papers, I ran across a pretty cool thing. It was a letter she passed on with a few words of advice that a favorite teacher from Elementary school had given me. Her name was Mrs. Cummings and from the time I met her in 5th grade until I moved from Cincinnati to go to college, she was very much a part of my life. Unfortunately we lost touch shortly after I left. However she has always remained in my heart as one of the teachers that really encouraged and inspired me to push harder and constantly try to achieve my goals. She is one reason I am where I am today. Below is the letter that she shared with me so many years ago. ‘There are two days in every week about which we should not worry. Two days which should be kept free from all fear and apprehension. One of these days is YESTERDAY – with its mistakes and cares, its faults and blunders, its aches and pains. YESTERDAY has passed forever beyond our control. All of the riches in the whole wide world cannot bring back YESTERDAY. We cannot erase a single bitter word we uttered. YESTERDAY is done! The other day we should not worry about is TOMORROW – with its possible adversities, its burdens, its great promises and its deep sorrows. TOMORROW is also beyond our ability to control. TOMORROW’S sun will rise, either in splendor or behhind a mask of dark clouds – but it WILL rise. Until it does, we have no stake in TOMORROW, for it is yet unborn. This leaves only one day – TODAY. And of us can fight the battles of just one day. It s only when you and I fight the battles and burdens of those two awful eternities – YESTERDAY and TOMORROW – that we break down. It is not the experiences of TODAY that drive men mad – it is the remorse or bitterness for something which happened YESTERDAY and the fearful dread of what TOMORROW might bring. So with those words said, I must say that it’s time to move on and figure out what we are going to do next… what are we going to do today, to live, to work, to survive in this economy and this United States of America? The bottom line is that Barack Obama has been elected to be our next president and many of us do not like that fact. However we still live in one of the greatest countires. There is nothing we can do about yesterday. There is plenty we can do TODAY so that our TOMORROWS are bright and sunny… so that we have a secure future. We may have to work harder and pray harder to get there….and I believe in a God who turns everything into good and I have to believe that things are going to be OK.
God Bless and LIVE A FULL DAY! 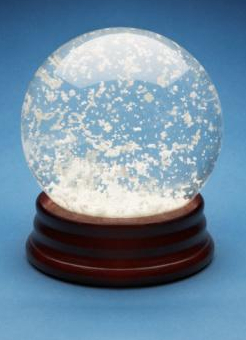 Have you ever felt like your life is that of a snow globe? That’s how my life has been…as if I’m standing in the middle of one of those cool little snow globes that has been shaken up and keeps getting shaken so the little snow pieces aren’t settling just yet….my life has continued to be crazy busy, full of changes and yet so beautiful at the same time. This past weekend, we moved the Blu Dove office. Dad – if you noticed the server offline – that was why. It’s a positive move and we’re all excited – we have more space – John and I each have our own offices (well John is sharing his with an intern) – we have access to the shared conference room, shared lobby and kitchen – quieter space. It’s really quite awesome! Thank you to Andy and to John for helping get everything moved – it was probably one of the easiest moves I’ve done. The stuff is now in the new space, the new desks are assembled … the routine, however, has not yet been established and John and I have gone from sharing a roughly 225 square foot space (for the last 1-1/2 years) to actually having our own space. It is actually really nice, though it has gotten kinda lonely at moments and we find ourselves wandering into the other’s office to see what’s up. I feel unsettled b/c I can’t finish decorating the way I would like… for several reasons 1) I have a new “roommate” on the other side of the building that I have to consider b/c we share some of the space and he is currently out of town. 2) I don’t have enough frames to put stuff in and 3) there are things I need formatted and printed out that I would like to frame. To add to that, we rescued a puppy from our neighbor’s house and have been working her into the family – which is much like having a small child for those of you who have not raised a puppy. None of this is a big deal and it’s all really great news – it’s just that some of the “snow” hasn’t quite settled. So rather than fight it, I stand here in the middle of my snow globe (at the beginning of summer) waiting for it to settle around me…trying not to let it stress me out and praying it will settle soon…and knowing at the same time, that life is never without a little snow and THAT is what keeps it interesting. So tonight I write about breathing… about focus… about purposefully spending time with God. Tonight I take time for myself in my own little retreat away from everyone (except the cats who insist on keeping me company). Thursday nights is our small group meeting at Vineyard – tonight we watched a video with Rob Bell (by NOOMA.com) called Breathe. In it he talks about our breathing and asks a ton of questions like – How many of us really think about our breathing? Have we ever considered that our breathe is also the spirit of God? Is God’s name really pronounceable? – it wasn’t it Hebrew. The one thing he said that really struck me was that he talked about how we get so busy that we stop seeing the burning bushes and we stop breathing in God and breathing out the stuff that God wants us to let go of. That life just passes us by. Today I felt like that. And the past several days, I’ve felt like that….kind of disconnected from life, going through the motions, surviving, being responsible, being the good wife, daughter-in-law, boss, friend, business owner… I feel so tired. It’s been more than a week now that I’ve had a true day to myself – to reflect, to seek, to breathe in God. I’ve been coming and going here and there. I’ve been planning, meeting, running and not taking any time to just sit and breathe. And yes, I feel that I have a blessed life and am extremely grateful – I also believe that I have stopped taking time to enjoy the life that God has given me because I have gotten so busy. Last Friday Andy and I had friends from church over for dinner. It was a great time of food and fellowship. After dinner we went outside to spend time with the horses and I noticed that Astar was acting very strange — he’s usually wanting to to be the center of attention and this time he was kind of off in his own world. I commented to Andy and my friends that Astar was acting funny – so I’d keep an eye on him…. he’s been kind of that way all week with me even though I caught him up and worked with him on Monday. Today, I went to meet the vet where Irish is currently living (our newest addition to the herd) and as I was spending time with him, grooming him and talking to him, I felt the same distance. As I looked at Irish, I realized – it’s not the horses (not Astar or Irish), it’s me! I’m the one that’s been distant and aloof! I’m the one that hasn’t been quite right and the horses have sensed it. The other thing I noticed as I thought back on today after listening to the video – was that I let precious moments slip by me – I could not clear my head of everything long enough to give Irish the time he deserved this morning because all I could think about was everything else I had on my plate during the rest of my day…. I’m sorry Irish. Even during my client meetings, I found my mind drifting off to other things I have going on — how can we get roofing material…I wonder if they know someone who does scrap metal…wow, it’s gloomy outside. During small group, I was thinking about Wings of Dreams and their invitation – roofing material again – how to securely strap a tarp on the roof for now – what does God want me to breathe OUT….hmmm…LOL? When Rob Bell was talking about breathing and how we don’t really think about it – that it’s not a focused thing we do, my thoughts drifted to Pilates. It’s the one time in my week that I get to stop everything I am doing, turn off my cell phone, and I have to focus on my breathing…it’s actually rather relaxing though it’s also a workout. I feel so much more focused after I leave – I’m ready to conquer the rest of my day. So it makes me wonder – if I applied my focused breathing exercised to more days in my week, perhaps I could focus more and feel less overwhelmed. Perhaps I could feel that peaceful presence that I feel after an hour of focused exercise and breathing…the peaceful presence of God wrapping His arms around me in a comforting embrace that lets me know I can handle anything that comes my way – that He will provide all of the time I need to get everything completed that I need to get completed. I pray that God gives me the focus and peace, to stop and smell the roses – to relax long enough to spend time with my horses, friends, husband and most importantly Him. I also pray that if you (who are reading this) are like me and find yourselves without focus and feeling overwhelmed that you will stop, close your eyes, just breathe and ask Him to fill you with His breathe! Well, my answer is simple. I wanted a new beginning to go with 2008. I never felt truly inspired by my old blog — sure, I wrote a couple of things and then it waned. I just wasn’t thrilled with the set up, the name, the style, the overall feeling of the site. Last fall, I attended a women’s retreat where the topic was based around John Eldredge’s book, “Epic” – an excellent read! It explored the idea that we are all on a journey, we each have a story to tell and that we are part of an even bigger story….God’s story. This has sparked in me a desire to tell my story AND to hear others stories. So here I am starting over, picking up where I left off and I believe that this year promises to be a better year for writing; for opening up and experiencing a deeper level of communication with my friends and family; for sharing learning more about my part in God’s Epic story. I’ve transferred all of my photos from my previous blog and plan to add new ones as soon as I get to my high-speed connection (yes, we live on dial-up out here in Archer). I am excited about the future and what it hold and hope you will join me!